It's Pawty Time for Puppy Tales..... with a Giveaway our Furiends! Help us celebrate our new ‘home’ by pawticipating in our epic Launch Paw-ty Giveaway! Don’t you love when a long term plan comes together, such as moving house, going on a road trip, or getting a puppy? Well, here we have ‘da zoomies’ (that is we’re celebrating!) … because after 18-months of dreaming, designing, planning, and development, we’ve finally moved the Puppy Tales website to a brand new home. Woof, woof! The new site is to dog lovers, what a really engrossing scent trail is to a beagle. We hope you will be enchanted by fascinating world of all things dog! In pawticular, Puppy Tales endeavours to help you make the most of each moment with the fur-friends in your life, including with ideas & tips for activities, fun, adventure and travel. It also brings our photography services into their fitting place in Puppy Tales house! Puppy Tales is a natural home for dog lovers who want to come together in a celebration of canine kind. We hope you’ll unearth a whole treat-bag full of inspiration and helpful info, to make life with your pet pal even better. Dog Photography: Whether it’s paws-ome photographic dog stories, practical hints and tips to capture your buddy’s best side, photo inspiration, or booking us for a photo experience with your bets buddy, immerse yourself in a visual feast of all things dog-related. That’s a whole bunch of reasons to bark and woof about, right there! Celebrate this milestone with us and join the fun at our Puppy Tales Launch Pawty. 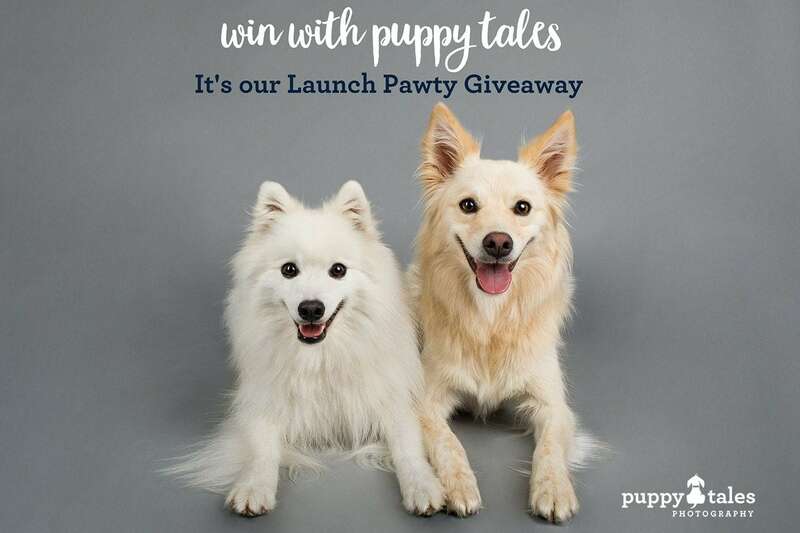 There are heaps of great prizes, so why not ‘paws’ a while, give the new website a good sniff and then enter the Launch Pawty Giveaway. Plus, there’s four prizes of a Puppy Tales photography gift certificate (value $500 each). Information on the different photography services we offer is found here. Eligible to Australian entries only. Main prize – A large digital watercolour hanging print of your dog (value $250). These beautiful artworks are custom created from a favourite photo of your fur-friend. Eligible to Australian and International entries. Do you know what to do when your dog injures themselves? What about when they are sick? It’s a horrible, helpless feeling when our dogs are sick or hurt and that’s where the peace of mind of a dog first aid kit comes in. We don’t go anywhere without our Creature Clinic first aid kit and were pleased when our gorgeous friend Dr Joanna Paul offered one for this giveaway. The kits are comprehensive, helpful and practical. Alongside all the first aid items you could need is a first aid guide – no longer do you need to rely on ‘Dr Google’ (and internet connectivity) in an emergency – you have qualified guidance from a knowledgable, practicing Australian vet at your fingertips. We’ve lots of great smaller prizes and thought a daily prize would add to the pawty fun….. so we dreamed up the ‘Licky’ Dip! There’s gift certificates from some of our most favourite dog stores! And grooming products, toys, collars and lots more from brands we’ve worked with and who’ve sent us products. Each day for the duration of the launch pawty we’ll announce the prize and winner (and pawsibly some fun to-do related to a particular prize!). Everyone that has entered up to that point and selected to the ‘Licky’ dip on their entry will be in the running to win that days prize. Entry has closed – winners will be announced soon! This giveaway is hosted by Puppy Tales. By entering your details in the contest, they will be added to the Puppy Tales Pack and receive our Newsletter. You can unsubscribe from this at any time. Multiple entries via the online form will not be accepted. The giveaway is open to all readers aged over 18, however please note some prizes will only be shipped to specific destinations only as noted. Winners for each prize will be chosen by random computer generation. The ‘Licky’ Prizes will be announced and drawn on random dates throughout the giveaway. The winner will be selected from all those who’ve entered for the ‘Licky’ prize at the time they are drawn. Follow us on Facebook and Instagram for announcements about them! The competition will close on on Wednesday 13th September at 9:00pm Australian EDT and the winners drawn at this time. Winners will be advised via the email addresses provided. Winners will need to provide shipping address so that their prizes may be shipped to them. Puppy Tales will take no responsibility if the prize winner’s contact details are incorrect/incomplete and the winner cannot be contacted. If any product or item becomes unavailable, the Brand or Business will offer a replacement prize of equivalent value.